When you are planning on a new building or addition for your business, it’s important to find local contractors who have the skills and experience needed to create quality outcomes that are sure to be beneficial for the life of the structure. One area in particular that has gained in value over the years is the property construction of your building envelope. Often known as the physical barrier between the outside and inside of your business, the building envelope can help to make or break the outcome of your project. You can benefit from working with a commercial drywall company that knows the ins and outs of the industry, minimizing setbacks and streamlining your project for a timely and affordable product. AZ Drywall Finishing is proud to serve as your team of experts in Illinois, delivering high-quality results on every job we complete. Our drywall contractors help Chicago businesses to minimize downtime and take advantage of the quality of our work. Today, we’ll continue to discuss the different elements of a building envelope and how these materials can help to boost energy efficiency. When done, be sure to contact our drywall finishers to receive an estimate for your project! A proper wall design is essential for keeping the elements out and keeping your energy bills low. Any exterior above-grade wall is tasked with insulating the home from the outside elements, but this is often no easy task. Your building process can greatly affect the stability of your wall system, from cracked cement elements to insulation gaps and everything in between. If your walls aren’t properly protected, you can expect to suffer from a chilling draft that does little to enhance your business’ comfort. Insulation. There are numerous insulation batts and blankets to choose from to insulate your walls for Chicago’s frigid temperatures. As one of the biggest envelope surfaces in the home, your walls should be insulated properly to increase building comfort and cost efficiency. Building insulation can typically be blown in or rolled out. Structure wraps. Buildings that need comprehensive coverage can benefit from wrapping their commercial building in this layer of quality. Wraps are useful for preventing air from entering the building envelope, delivering better overall results for your eco-efficiency. Studs. Our metal stud framing contractors are here to offer quality solutions if your building requires added protection from the wind or cold (which happens a lot across our state). One way to reduce thermal transference is to offset your stud framing to add further protection from drafts. Joint Tape. Air is able to infiltrate the smallest crevices, and if you have joints in your insulation, the results can be disastrous. Sealing all of the joints within your building envelope can go a long way in reducing energy loss. Doors. As a large opening that serves as the entry point to your establishment, the front door should be insulated and rated to protect your business. The better your door is able to withstand the elements, the more comfortable your business will be overall. Exterior doors come in all varieties and styles to ensure a perfect fit for your place. Windows. They say that old, ineffective windows can be heavily blamed for energy loss, and we couldn’t agree more. Modern replacements utilize technology to provide the best protection for your windows, including insulation and thermal coating procedures. Weatherstripping. No matter how nice your doors and windows are, they are nearly useless without the proper caulking procedures to seal air out and keep comfort in. Any gaps in your windows and doors can result in big setbacks with your monthly heating bill. While we excel at installing drywall, our contractors understand the importance of comprehensive building health. Your business’ roof is one aspect that should always take a high priority. From sealing out moisture to blocking drafty winds, your Illinois business can benefit from comprehensive roof solutions. Our commercial drywall company is dedicated to the best building practices in the industry, and our team will work with your roofing contractor to find a quality solution for your business. 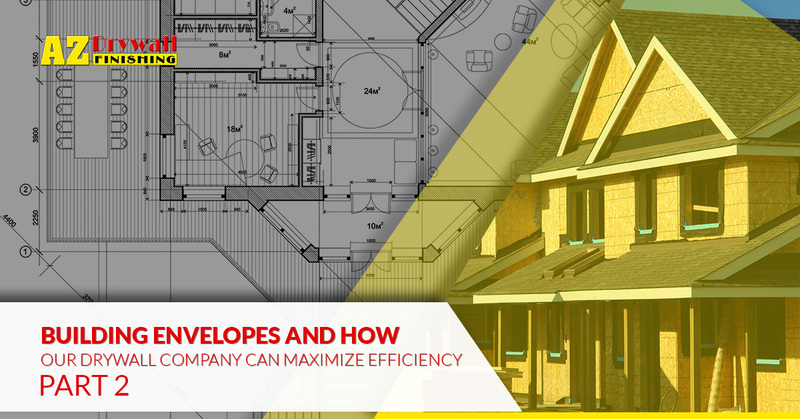 Your building envelope is a crucial part of your building’s efficiency plan. Failing to properly care for this section of the building can result in costly setbacks for your company. AZ Drywall Finishing is here to serve as your comprehensive source for wallboard services, from metal framing to final finishes and more. Since 1999, our drywall company has worked hard to deliver the best results for each and every project we step foot on. Contact us today to see how we can improve your structure!